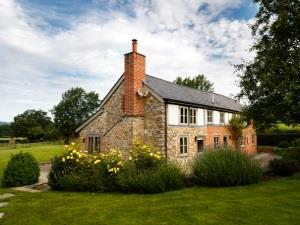 Little Canwood House07922431817work Self-cateringLittle Canwood House is a 5 Star Tourist Board rated self-catering holiday cottage situated in heart of rolling countryside offering beautiful views over the rural farmland of Herefordshire. Little Canwood House has been sympathetically restored to create a traditional yet modern feel, with self-catering accommodation suitable for families and groups, sleeping 7+1. Situated less than 15 minutes from Hereford City centre and approximately 20 minutes from the M50 motorway means that the accommodation is easily accessible. If you are looking for comfort, style, location and a country holiday, this is the place for you! Enjoy cooking on the Aga, eating with your group in the comfortable and stylish surroundings, warming your toes in front of the wood burner stove or relaxing on the sofas with a good DVD! There is a games room on site, which is shared between our two houses, however each house has its own access to it from their garden. Each property has its own private garden and the games room is a separate building situated between the two gardens. Please contact us for more details. PLEASE CHECK YOUR SPAM EMAIL AS WE RESPOND TO EVERY ENQUIRY. Full use of the 18 Hole Golf Course. The company is a local company with 5* reviews and excellent customer service. Little Canwood House offers weekly bookings starting on any day and short breaks of 3 days starting on any day. Little Canwood offers weekly bookings starting on any day and short breaks of 3 days starting on any day. Leave motorway at junction 3 and head towards Hereford on the B4221 to Upton Bishop. Take the B4224 for approximately 3 miles. After the village of How Caple take the second turn on your right signed to Woolhope. Continue along this road for approximately 2 miles and turn right towards Woolhope village. Take the first turn left after the Crown Inn and continue to T junction. Turn right and shortly after turn left towards Checkley. The 5 star holiday house will be found approximately 1 mile on the left hand side.